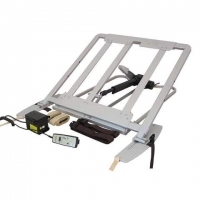 Mattress inclinators (or variators) are electrically or battery powered, sit up devices. 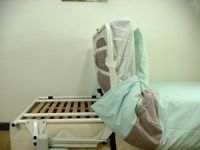 They are placed under the head-end of a mattress to raise the mattress to form a backrest. 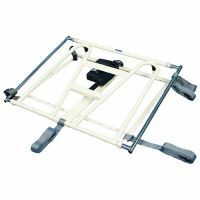 Mattress inclinators can help you sit up and lie down independently. They can also remain raised to form a backrest to support you in a sitting position. They are available for single or double beds. Most are controlled with a handset with either two separate switches or a rocker switch, however alternative controls, e.g. a joystick are sometimes available. Check that your mattress is compatible with mattress variators. Hinged mattresses are most suitable and fibre or foam-filled mattresses are usually compatible. Mattresses with continuous wire edging are unsuitable and pocket sprung mattresses may be damaged by long term use. If the mattress moves down the bed when the inclinator is used you may need to fit a mattress stop to the bottom end of the bed. Most inclinators do not angle under the knees to form a knee-break, therefore you'll sit with your legs extended. This means that there is a risk that you may slide down the bed. This movement may increase the risk of developing pressure ulcers. 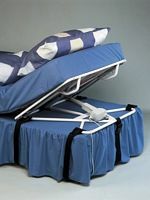 If this does cause difficulty than you may wish to consider a variable posture bed as many models have the option to raise your knees to help prevent this happening. The amount of noise made by these units varies. Personal preference and whether other people nearby will be disturbed needs considering. Air bags tend to be noisier and hydraulic pistons quieter. 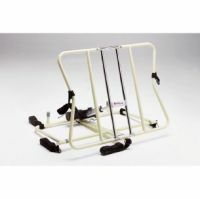 Mattress inclinators usually lift the person forwards and away from the bedside cabinet. A few models are designed to slide back as they lift so that the cabinet is still in reach.